The Hotel Culinary Arts and Tourism Department of Tralee IT in conjunction with Taste Kerrry will host an action packed one-day event called ’Food 4 Thought’ which will take place on Wednesday 26th April 2017. This is an exciting showcase of the best culinary talents in the region and beyond with a series of workshops and demonstrations, many of them were free of charge, created to attract food Industry professionals and food lovers alike. It also include an extensive food market highlighting the great food producers in the region. Now in its Fourth year, this event will build on previous year’s success by enabling visitors to further their education and skills in the art of artisan Sour Dough bread making with Orla Gowen of Bacus Bakery, The use of Seaweed with RAI “Kerry Chef of the Year” James Coffey and John Fitzgerald from Atlantic Seaweed and the Modernist Cuisine Techniques with Chef Dan Browne from ITTralee and Modern Cooking Techniques with Caroline Danaher from Corcoran’s Food Equipment. The matching of Beer and Food will be presented to you by Des McCann and Owen Murtagh from Molson Coors, as well as sampling the new food product range developed by the departments third year BA culinary arts students. Fast becoming the centre of culinary excellence in Munster, the Department will also host an in conversation with Chefs in conjunction with “Chefs Network” to discuss the current CHEF Shortage and possible solutions and also three very successful women from the industry will host a workshop to tell you their respective stories. The lineup of the day will also include Cookery demos from Mark Doe from Just Cooking Cookery School and the Apprentice Chef and Ed Atwell from the Great British Menu with other industry experts. The Hotel, Culinary Arts and Tourism Department at I.T. 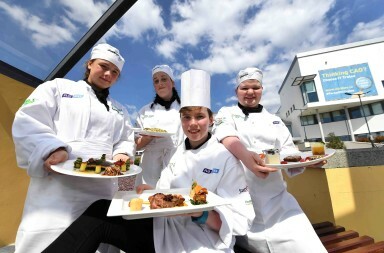 Tralee has proudly been preparing students for the three facets of the worldwide tourism industry – culinary arts, hospitality and tourism since 1987. The HCT team brings a wealth of international experience combined with academic expertise and continues to develop strong industry links to ensure that the students receive a grounded education in their chosen specialist field. We strive to meet the ever increasing demand for qualified people in our ever growing industry and we hope that events like Food 4 Thought will showcase the future that this industry holds for perspective students said T.J O Connor.